Summer is the season of flowers. We enjoy them for their outrageous beauty. We give them as gifts to show gratitude, love, and appreciation. But why do flowers exist? Why do they bloom in summer? Flowers are nature’s way of expressing desire—the desire to attract pollinators, the desire to reproduce, the desire to live again another year. Flowers bloom everywhere, from the highest mountains to the lowest deserts. 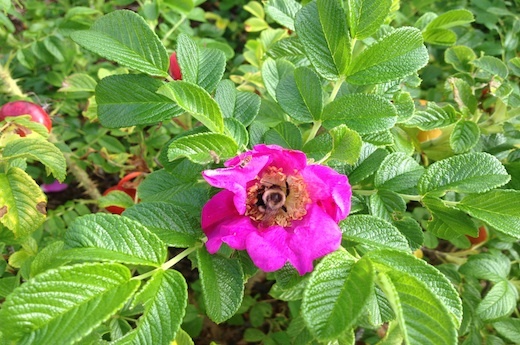 The Rosa rugosa is a rugged beach flower with the quintessential fragrance of rose…. What is your desire? Where is your optimal place to bloom? What kind of pollinators would you like to attract into your life? If you were a flower, which one would you be? Hold that flower in your heart and enjoy its beautiful fragrance. Revel in the desire to bloom! If I were a flower, I would want to be a Coreopsis, a wild flower often planted by birds, and I’d like those birds to be flying over Colorado! The strength and passion to survive that I see in flowers, gives me joy. Thank you for this meditation! Yes, summer is the season for flowers. If I were a flower, I would have to sleep it over for a few nights to be able to come up with THE one, but, after reading your post, I would have to pick “a very fragrant white with pink/burgundy flecked peony”…like the one that came with this 1928 bungalow that we live in. It is called, “Festiva Maxima”. Every peony lover should have this one – it smells divine! I see these all over summer they make me feel waves and sand very nurturing. The peony, my grandmother’s favorite! If I was a flower, I’d have to be a morning glory, climbing up my tree just outside the deck. It’s my husband’s favorite flower, so I know that he would look at me every day and smile!